The Broadway Lodge is Awarded Two Stars in recognition of the outstanding quality and service we provide to our customers. Next to Tolworth Tower, and Marks & Spencer car park, we are a well established and respected B&B within the area for over 6 years, and close to all amenities. All rooms are En-Suite and feature: colour TV and Video, Tea & coffee maker and fridge. 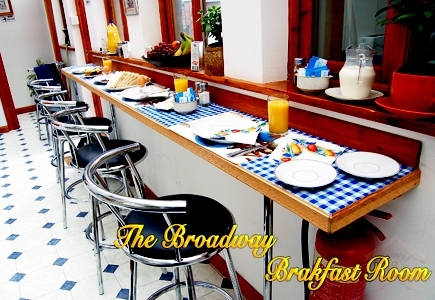 All prices include: Freshly cooked Full english breakfast & continental breakfast. 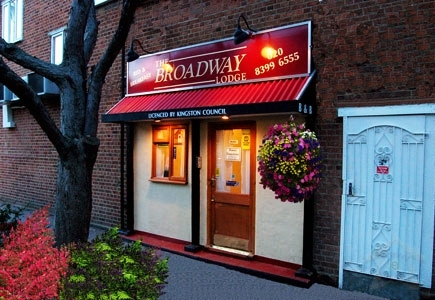 The Broadway Lodge provides very comfortable and welcoming facilities where a friendly and relaxing atmosphere is encouraged. Within easy reach for many local businesses and shopping centers. Transport Links: Tolworth railway station - 1m Heathrow airport - 15m, The A3 linking to M25 to Gatwick & Heathrow airport,. Places To go: Chessington World Of Adventure -3m, Wimbledon Tennis Club- 6m, Hampton Court Place-5m, Sandown Park Race course-4m, Kempton Park Race Course-8m, Nearest Towns/nightlife: Surbiton-2m, Kingston Upon Thames-3m, Central London-14m. Our twenty rooms are designed in a style with your relaxation in mind, as your personal needs and home comforts are our priority. This is why every room comes with luxurious en-suite bathrooms fitted with power showers, internet access using wi-fi technology, TV, and tea and coffee making facilities. We can accommodate you in either single, double or family rooms. Bookings: A credit card is required at the time of reservation to \"secure or hold\" the reservation. The credit card will not be debited unless the guest fails to arrive. Cancellation Policy: Bookings cancelled later than 48 hours prior to arrival will incur a cancellation charge.